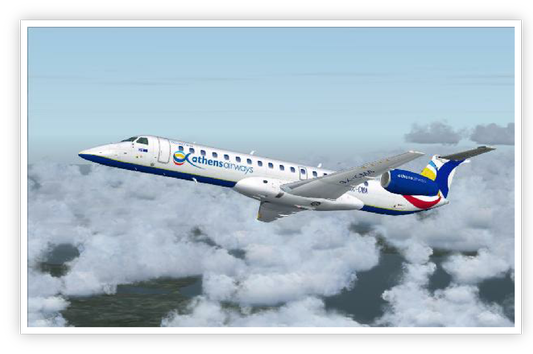 Athens Airways was founded in 2008 with a sole purpose to cover the void of a low cost air company that was absent in Greece. Athens Airways that has Athens airport Eleytherios Venizelos as its base offers economic flights to 14 domestic destinations. The company’s fleet comprises by four jet planes that offer comfortable, pleasant, safe travel and give the passengers the feeling that they are flying on a private jet. The perfect services in combination with the low prices have made Athens Airways one of the favourite airline companies in Greece. During specific periods of time there are special offers and cheap flights with prices that begin at 1 Euro! On 10th October 2009 and according to the company’s development plan 3 new connections were added: Athens - Corfu, Mitilini - Kavala and Thessaloniki – Rhodes, while it is being forecasted that in the near future the number of company planes will be increased in order to service more destinations. Flight offers with Athens Airways for: Athens, Thessaloniki, Heraklion, Corfu, Rhodes, Alexandoupolis, Chania, Kefalonia, Ioannina, Chios, Mykonos, Santorini, Kythira, Kalamata, Kastoria, Kavala, Kozani, Mytilini, Samos, Volos, Zakynthos (Zante).